On February 6-8, 2013, CAIDA hosted the 5th workshop on Active Internet Measurements supporting science and policy. This workshop continues the series of Internet Statistics and Metrics Analysis (ISMA) workshops that are held to discuss the current and future state of Internet measurement and analysis. The workshop focus this year is on creating, managing, and analyzing annotations of very large longitudinal active Internet measurement data sets ("big data", O(TB) over several years). Due to popular demand, we also dedicate half a day to large-scale active measurement (performance/topology) from mobile/cellular devices. In response to overwhelming survey feedback from previous years about these workshops spending too much time with speakers and not leaving enough time for interactions, we are limiting all talks to 10 minutes (unless indicated otherwise), and talks that are updates from previous AIMS workshops to 5 minutes each, plus 5 minutes for questions after each talk. This schedule is intended to make more room for structured and unstructured interaction. 09:00 - 09:30 Round of introductions: "What I want to get out of the workshop"
14:00 - 14:40 Measurement Systems, cont'd. Why are we talking about data sharing? 09:00 - 09:45 Roundtable: "What I learned from the workshop yesterday"
09:00 - 10:00 Roundtable: "What I learned from the workshop yesterday"
Phillipa Gill (The Citizen Lab/Stony Brook University), Characterizing Global Web Censorship: Why is it so hard? For this workshop, attendees are expected to make their own hotel reservations and transportation arrangements from their hotels to the workshop. For CAIDA's list of recommended local hotels including shuttle availability, see the updated Recommended Hotels list (PDF). Parking Permits: Parking permits are required to park on UCSD Campus. On arrival to campus on the morning of Day 1, check in with a CAIDA staff member just before the small parking strip (P306) on International Lane near the Institute of the Americas plaza. 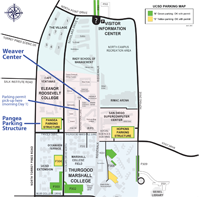 We will give you a parking permit for the day, and then point you to the Pangea Parking Structure for parking. A campus map for the AIMS workshop shows where the permits will be distributed, the parking structure, and the Weaver Center where the meeting will be held. Parking permits for Day 2 and Day 3 will be distributed at the end of the previous day's session.